This was almost an impromptu decision to drive to Bhopal from Bengaluru for Diwali. Being Diwali, air tickets were too expensive and train tickets were not available. So the decision to drive was made. Due to some pre-scheduled events, we could only leave by afternoon on Saturday. 1:30 PM We left Hyderabad. 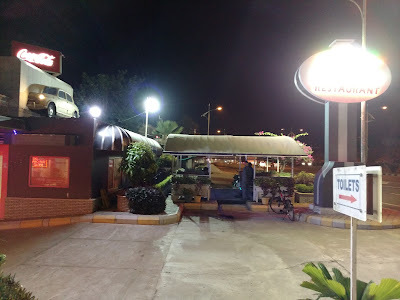 We stopped for a quick bite on the way at Mc Donalds on Airport Road and then continued on with our journey. 4:40 PM Stopped at A1 plaza for a quick tea. 9:50 PM Reached the destination for the day. As usual Bengaluru to Hyderabad road is in great condition. It was an eventless journey. The plan was to start early for onward journey. We decided to carry packed breakfast so that we don't have to stop for a breakfast stop. 5:10 AM We were quickly on the outer ring road, saw a truck completely in flames on the outer ring road. 5:48 AM Just got out of ORR and got into the HP Petro Bunk for filling. 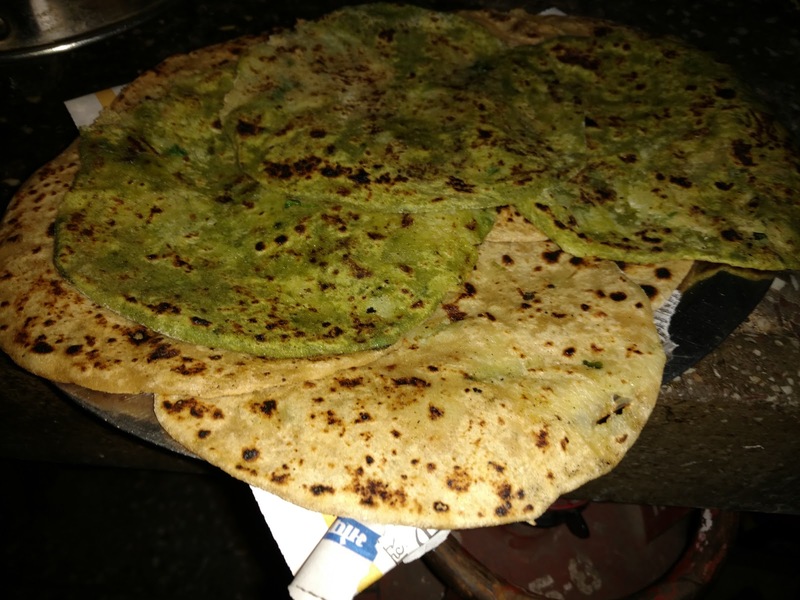 7:52 AM Stopped at a road side Dhaba called Kunthala Dhaba at a place near Neredgonda. They had ladies only toilets, not very clean but can use it in dire emergencies. On the way one finds strange drivers who just won't let you overtake them. It is just a strange ego trip that some of these drivers are on. 8:50 AM We cross the border and enter into MH. The road is under construction here for quite sometime so the progress is comparatively slower. Still the road surface has been fixed compared to last time I drove here.But you still have a undivided two lane road. The saving grace is the fact that traffic is thin on this stretch. 10:20 AM We cross Hinganghat. The road improves as soon as one crosses Hinganghat. 11:30 AM We reach Nagpur. We look for a place to eat, we located this restaurant called The Breakfast Story not very far from highway and stopover for a brunch. 12:35 PM From Nagpur there are two options to go to Bhopal, one goes via Chhindwara and other via Betul. We decide to go via Chhindwara while going and Betul for returning journey. Chhindwara route is a more scenic route, is longer. 2:20 PM We cross Chhindwara ring road. 3:30 PM We enter the forest that leads up to Panchmarhi. This section of road is full of ghat sections, and progress is extremely slow. 5:10 PM We reach Highway Treat in Pipariya. Time for a break for tea. 5:30 PM We start from the restaurant, being the day before Dhanteras pipariya market is extremely crowded and we take another 20 minutes to get out of the city. 9:00 PM We reached home in Bhopal. Time for Diwali festivities and general time pass. We decide to a visit to Bhojpur temple since we had not been to that place for quite some time. 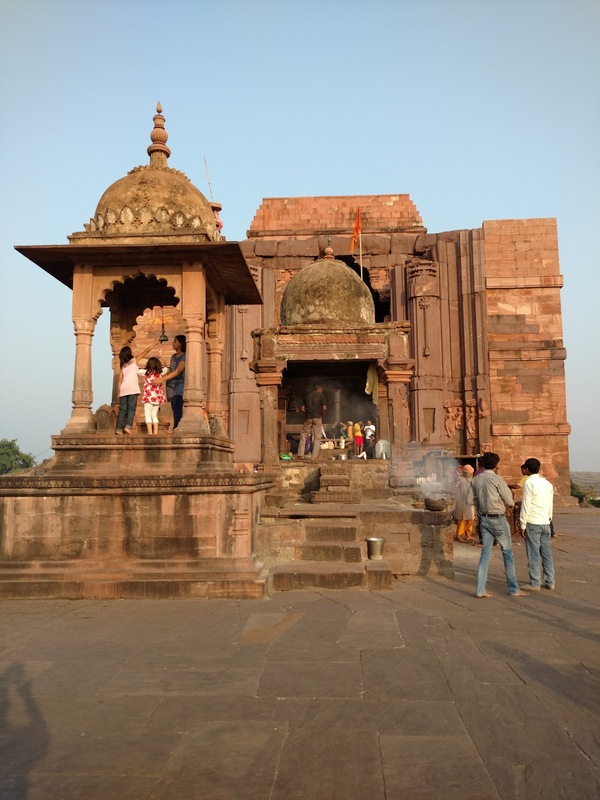 Bhojpur Shiva temple was constructed during the reign of King Bhojdev of Parmar dynasty during the years 1010 to 1055 AD. The temple was never fully constructed. The temple has a Shivaling which is 2.03 meter in height and largest in India. 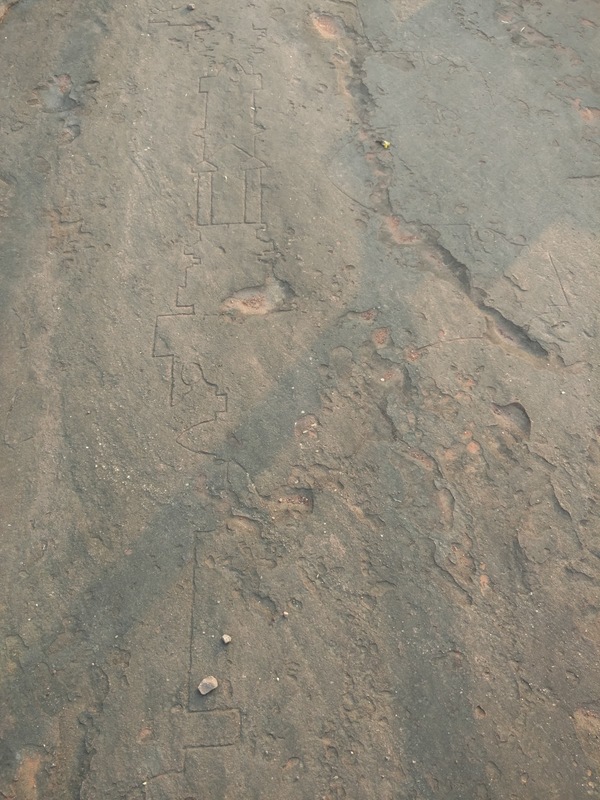 The temple is unique because near the temple one can find drawings of the temple etched in the rocks. 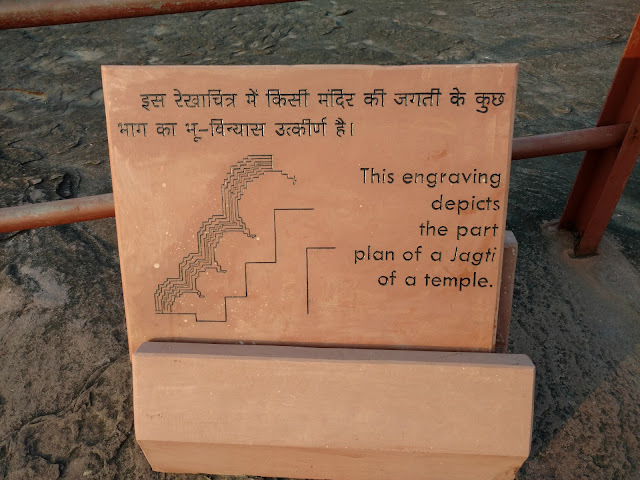 It also looks like as per the plan many other temples were to be constructed and never completed. The temple also has a river nearby and one can trek down to the river. The return journey starts, we had planned to leaving early morning and carrying food so that we can time of stops that we need to make. Also we decided to play it by the ear. If we reached Hyderabad at a reasonable time then we will continue to Bengaluru otherwise we will halt at Hyderabad. The first order of the day was to get some food ready. There is nothing better for a journey than home cooked aloo parathas. 5:20 AM We were on the road. 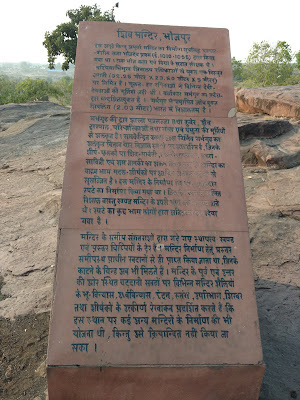 We took 11th-mile ring road out of Bhopal and quickly were on Hoshangabad road. 8:18 AM We cross Betul. The road just becomes fabulous after Betul. 10:40 AM It was too early for Lunch and too late for breakfast. Most dhabas that we encountered were closed. So finally we stopped at the A1 plaza at Reliance petrol bunk. 11:45 AM to 1:30 PM We missed the turn towards hinganghat and drove in a wrong direction for a while. So we had to retrace our steps back to the right place. We wasted a total of two hours in this misadventure. 2:55 PM We reached Adilabad. The non-so-good roads at the border take around one hours to cross. We encounter some really dangerous driving by local bikers. Here is one example. Here are some important statistics from the journey. Finally, the journey was over. Some lessons learnt for me are as follows. It is very practical to do Bhopal to Bengaluru in a day with two drivers. Start early from Bhopal and you can be in Bengaluru just after midnight. In any event, cross Hoshangabad to Bhopal road early in the morning. The road is just horrible and has too much traffic in any other time of the day. Bikers can be extremely unpredictable. Particularly the local bikers. Almost all of them think they are superman and just don't give a damn for road rules etc. If you are driving beyond midnight, always have another person capable of driving. I have realized that I need few hours of sleep around midnight if I need to drive. During this trip, the total toll amounts were close to Rs. 3000/-.